In order to gain a competitive advantage in the anaerobic digestion industry, Berlie Technologies Inc. has created a partnership with a German company to provide a high performance anaerobic digestion technology. 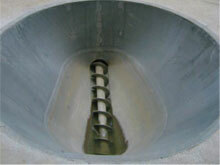 Since 1994, this technology has been validated at large scale on municipal sludge and certain organic wastes. It allows for shorter treatment times (about seven days), compared with conventional anaerobic digestion processes (about twenty days). 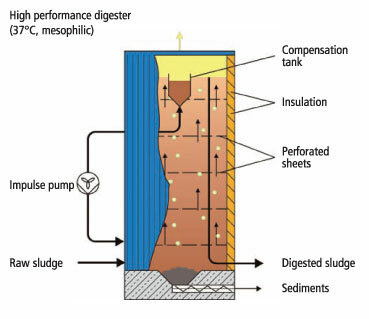 The sludge flows through the digester from the bottom to the top in a plug flow fashion. The impulse pump, together with the perforated sheets, ensure a gentle local mixing of the sludge bed. This mixing impulse takes fresh organic material to the microorganisms and separates biogas bubbles. The biogas is collected in the roof area of the digester. 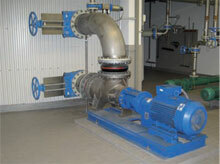 The energy requirements of this special system are small compared with conventional systems. An automatic sediment discharge system allows for continuous operation without the need of emptying the digester for sediment removal. A major portion of municipal and industrial wastes is made up of organic material that can be transformed into energy, namely biomethane. The biological process on which this method is based is achieved by the action of anaerobic microorganisms, without the presence of oxygen from the air. A variety of bacterial strains play a part in the digestion process and their composition depends on environmental conditions (substrate composition, temperature, pH, etc.). Under the action of these microorganisms, the organic material is decomposed into biogas, a mixture of methane (CH4) and carbon dioxide (CO2). Besides biogas, the digestion produces liquid and solid digestates which contain nutrients and can be reused as soil amendments. Berlie Technologies Inc. has comprehensive expertise in biosolids and organic wastes treatment. Using a turnkey approach, it can design and provide various processes and equipment to treat sludge according to each project’s specificities, including anaerobic digestion, dewatering and drying, up to more than 90% dry solids. To optimize the value of biogas, Berlie Technologies Inc. offers various processes such as desulfurization, dehumidification, enrichment and production of electricity by means of co-generation. Need to improve existing digestion plants? In order to provide its clients with inventive solutions, Berlie Technologies Inc. also offers services to improve existing digestion plants, such as the addition of a pre-treatment phase or a high performance digestion phase.